Since launching Premium a week ago I received several complaints about pitfalls of Premium subscription. The main concern was about restrictive license that among other things preserved the rights for clouds to Tagul.com and required attribution to the site. It was not acceptable for many businesses. After considering the complaints I decided to change the Premium terms and pricing. New pricing is higher ($7.95 USD per month in case 12 months are prepaid) but now every Premium user is allowed to use Tagul clouds commercially without attribution to Tagul.com. 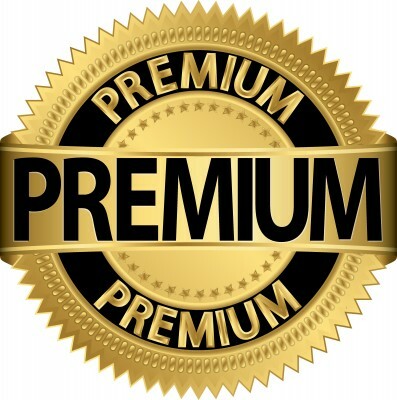 Today Premium subscription is being introduced. Premium subscription primarily targets users that use Tagul service in commercial purposes that way or another. But if you love Tagul and want to support its further development please feel free to purchase Premium subscription as well. Therefore the above features are no longer available to free users. Also changes to license terms have been made. Please read the new terms here. Glad to announce that embedding functionality is finally back! It was the final step in migrating from Flash to HTML5 and now there is absolutely no Flash in Tagul. If you earlier embedded your cloud in Flash then I strongly recommend you to update your web page with new (pure HTML5) code. The old flash code is not supported from now on. Today I am glad to announce a big update at Tagul.com. Tagul generator has been completely rewritten in HTML5 from scratch and more features were added (see the changes list at the end). The reason behind the change is that HTML5 is natively supported by both desktop and mobile browsers while Flash is not. That leads to better user experience and support of wide range of mobile devices like iPad, iPhone Android tablets and phones. The drawback is that HTML5 is modern technology and is not supported by old browsers (like Internet Explorer earlier than 10 version). Therefore if you start to see "Your browser is not supported" message please update your browser to the latest version or use any alternative one like Chrome or Firefox. 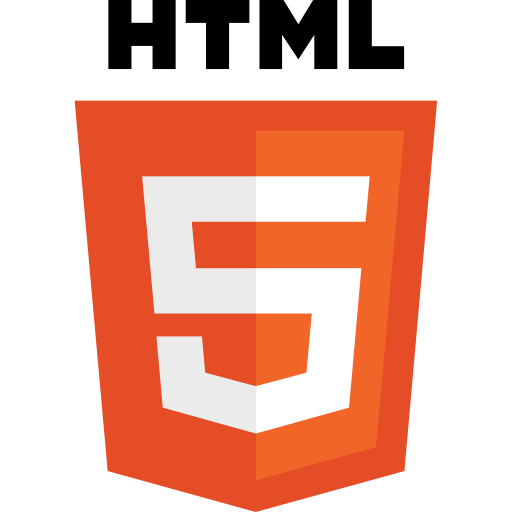 The transition from Flash to HTML5 is not completely finished yet. At the moment clouds web embedding is disabled as some more work needs to be done there. If you embedded your cloud in flash version earlier - you have nothing to worry about. Your clouds are still working and I will support it. When web embedding is enabled again you will be able to replace your flash clouds with HTML5 versions. * Filter common words section is removed. Now common words are removed automatically when you import words (it can be disabled using the corresponding checkbox). I am often asked on how to create a cloud with custom shape. 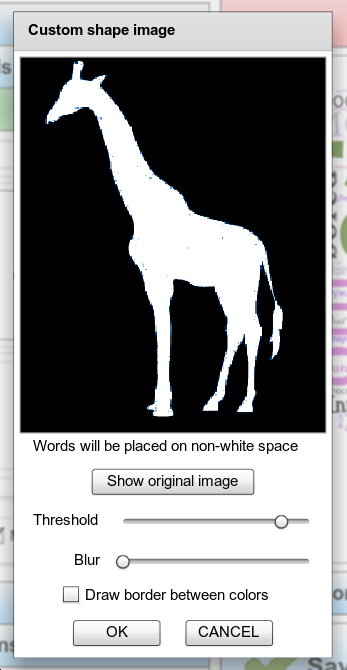 1) Find an image with a shape you want to use and save it to your computer. It can be either colored or black & white. Words will be placed on non-white space. Here is an example of Giraffe image which I used in Gallery. 3) Then click on the box (that says: "Click here" :)) and select your image file. In the appeared window use Threshold and Blur sliders to adjust the selected image. REMEMBER: the words will be placed on non-white space. 4) Then click OK and Visualize your cloud. Enjoy creating word clouds with Tagul.com!